We recently were representing a seller and we received an offer on their home – through an online home buying service. At first, the offer just seemed low – but then we realized the fees involved with accepting this already low offer would be more than double a typical realtor commission – PLUS repairs! Fortunately, we were able to find another buyer and the seller did not feel pressured to consider the online offer. But, it started a conversation in our office. Why would buyers and sellers use online realty services rather than working with an agent? A La Carte realty services are attractive to buyers and sellers who are confident they can sell or purchase their own home without needing the assistance of a local agent. For some people, these services will work. Just be aware that for the lower fees, you are agreeing to take on the hassle factor and responsibility that your agent usually manages. In many cases, the main service being provided through an a la carte realtor is getting your home listed in MLS. Sellers may still be responsible for all of their own marketing expenses. Usually, sellers have to schedule their own showings and negotiate their own contract. In other cases, the a la carte agent is paid a salary and has no incentive to help you sell your home quickly or for the best price. Depending on how much you are doing on your own, the risk here can be great if you don’t have someone with knowledge of your state’s real estate laws and requirements helping you with your transaction. The online Home Buying services offer the advantage of a quick sale. Typically, they purchase your home, do repairs, and then put it back on the market. You can expect that if you sell your home through a local agent or if you use an online home buying service, the same buyer will likely purchase your home in the end. The difference is that instead of you, the home buying service owns your home during the marketing period. This may be attractive to some sellers – just make sure you know all of the costs involved. After doing some quick research about these services you should be aware of a few things we noticed. You can expect to be paid a lower price for your home and to incur additional fees on top of an average 7% real estate commission, in some cases resulting in fees that double the commission you would pay a real estate agent. These additional fees are compensation to the service for the time they expect to own your home while it is marketed for sale. Also, you will be responsible for paying for any repairs they require. The trade-in services reminded us of trading in your car. You identify a home you would like to buy and they offer you a trade-in price for your home and help you sell and buy a new home in one transaction. How do the online options compare to using your local realtor? Buyers and Sellers are attracted to online realtor services because they believe it will cost them less and that realtors charge for many unnecessary services. So, we decided it might be important to share what services our agents DO charge for and what you might be paying for using an online service. First of all, when you work with Team Pogue to sell your home, we typically include a 6% real estate commission in our contract. That commission is split between the listing agent (Team Pogue) and the agent representing the buyer. That is the only fee you pay your agent to sell your home. Compared to the online services, the only other fee you will pay for is repairs. These will be negotiated through your agent to help you pay a fair and reasonable cost for any repairs needed. Typically, if you list your home with Team Pogue, we cover all of the marketing expenses UP FRONT to help you sell your home. For example, we hire a photographer to take professional photographs of your home, we create an online virtual tour and post it online to prospective buyers and agents to view, we list your home in MLS, we advertise your home online, we print brochures to leave at your home, and more. We will host open houses, community tours, and send out targeting advertising to help market your home and others we have for sale. All of the marketing expenses are paid for by your agent BEFORE your home is sold. We also incur other marketing expenses that are not specifically related to your home, but do include your home for sale such as our website, online ads, signs, and ads in local publications. We are only reimbursed for these expenses out of the listing agent’s commission once your transaction has closed. We also provide a secure, electronic lockbox to monitor all agents who access your home for showings.We have noticed that some iBuyer companies use a new tech & sensor option to allow unescorted showings for properties. Would you want a stranger to gain access to your home via automated door lock/sensor and then tour it without anyone there to supervise? Just one more reason to hire an agent. In addition to marketing your home for sale and providing a secure way to monitor potential buyers touring your home, Team Pogue provides many other services that help you with your transaction. We offer invaluable advice and expertise on the local market and how to position your home to sell. We know what homes are available and whether or not there are pocket listings that meet your criteria. We have relationships with agents and can help negotiate the best terms on your behalf. Our agents have completed rigorous licensing and continuing education requirements to become Certified Senior Advisors, which helps them provide personalized service to our clients who are active adults and seniors. They are knowledgable about state laws that govern real estate transactions. We offer professional photography services, virtual home tours, staging advice, custom flyers, and marketing services. We utilize services to schedule showings and coordinate repairs – removing the hassle factor from your list of things to do. Our agents prequalify buyers so that only qualified prospects will be previewing your home. We have relationships and a network of agents who specialize in our local market and can connect prospective buyers with homes they are looking for. Our team has been working in Indian Land for over ten years. Our agents are licensed and familiar with the particular nuances of the real estate market in our community. We know what issues can be a cause for concern and how to navigate those issues throughout the entire transaction. Our team lives, works and plays in Indian Land, so we have a personal stake in this community. We want the best for our clients because they are also our neighbors. Bottom line, we know buyers and sellers have many options available to them as they consider their real estate transaction. And, we realize that every client has different needs and goals. Here are just a few things we will leave you with to consider if you are looking into an online service. At first glance, these services may seem less expensive. However, beware of getting nickeled and dimed by hidden fees that may not be obvious at first. You may end up paying for costs (in time and in money) not even mentioned in your contract at all. In every case, there is a trade off between the services provided and cost to you. Is the savings worth the hassle factor? You may have access to a licensed agent, but they aren’t familiar with your particular market and the buyers and sellers who participate in it. They are limited to what they can find in an online search. Do you need an agent to do that for you? If you have bought or sold a home before, you may feel it isn’t worth paying an agent to help negotiate a deal for you or to manage the sales process. This might be true if everything goes smoothly in your transaction. However, this is rarely the case. There are always repairs to negotiate, emotions involved, financing issues and state laws which govern real estate transactions to consider. Is the savings worth the hassle factor? If there are issues or problems, your deal may be at risk if there are delays. You may have to do extra research to find solutions to a problem or contact contractors or vendors to get the deal done. Our agents negotiate transactions every day. We have relationships with vendors when we need something done quickly and we know who to contact when there are problems with specific builders or communities. Your transaction may not be delayed at all if you are working with a knowledgable agent who is familiar with the area and potential roadblocks to getting a deal done in your community. If you are considering utilizing an online service, please also consider making an appointment with an agent before making a decision. Our team will be happy to meet with you at your convenience and help you compare the fees and services being offered. As always, we strive to provide Real Estate with a Personal Touch! Spring Fever? Here are some things to do around the Charlotte Area! These beautiful flowers only bloom once a year – and only in one or two places in the southeast. If you haven’t seen them, you need to add this to your list! Check out the Landsford Canal State Park website for the best time to visit! Take a walk at Anne Springs Close Greenway. This fantastic park has walking trails, a summer concert series, and picnic areas. They also offer other activities and special classes in photography, meditation and more! Visit their website for more information. This farm is an easy choice if you live in Indian Land. It is close to home and they have several different varieties of berries. Be sure to check their website before you visit to see what is available. We picked strawberries this past weekend and they were delicious! Don’t want to do the work? No problem – the farm also sells pre-picked berries for your convenience. We liked our berries so much we even made a homemade strawberry cake – drop us a note if you would like the recipe! Visit the Daniel Stowe Botanical Garden. This garden is beautiful in spring and it isn’t too hot to walk around and enjoy the grounds! Plan to have afternoon tea while you are there! Or plan your visit around one of their many fun events such as birding walks, a sip and stroll, music festivals, art shows and more! Click here for a full schedule of events. Go see a Charlotte Knights baseball game! If you haven’t seen a Charlotte Knights game in their stadium, you are in for a treat. It’s a great afternoon or evening of fun for your entire group! Click here to see when their next home game is scheduled. 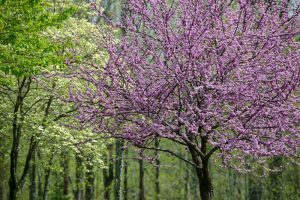 If you live in the Charlotte area, the whitewater center is the perfect place for a visit in spring. It is unique and there is not another center like it in the entire U.S. If you are a serious outdoorsman, you might enjoy the whitewater rafting, kayaking, ropes challenge courses or ziplines offered at the center. 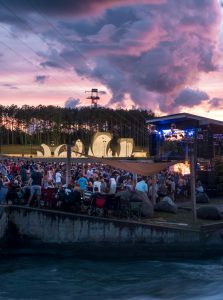 However, if you aren’t up for those activities, the whitewater center also offers flatwater kayaking and canoeing, walking paths, and plenty of space to relax and enjoy watching other visitors try their hand at rock climbing, rafting, and more. The center also boasts great craft brews, several good dining options and evening music and film festivals where you can relax and simply enjoy being outdoors. Check out their website for more information. Have some more suggestions? Please share them with us by calling Laura or Andrea at 803-504-1111 or by emailing us at Laura@TeamPogue.com. This is a neat article – we loved hearing the perspective of these seniors! With New Years Resolutions on our minds, we thought we would share! The article is entitled “Want to Be Happy? Think Like an Old Person.” published by the New York Times. 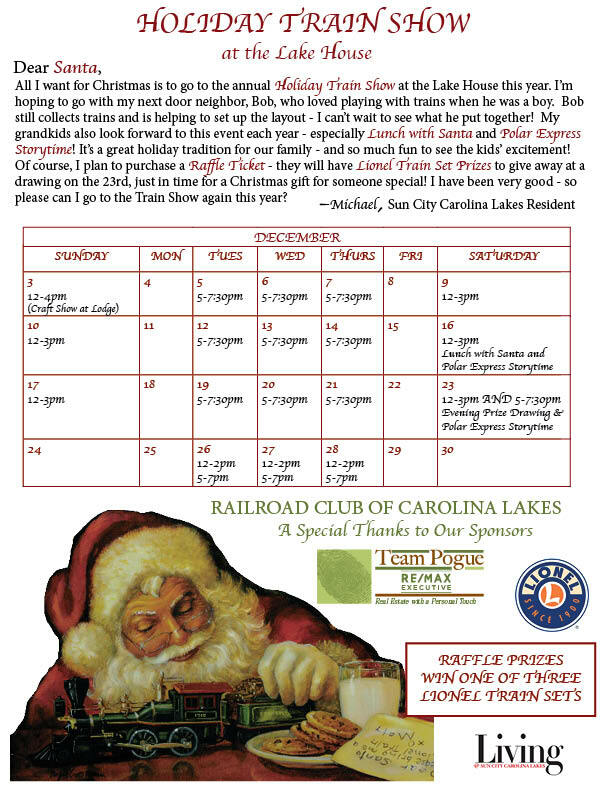 Don’t miss the annual Train Show facilitated by the Railroad Club of Sun City Carolina Lakes. 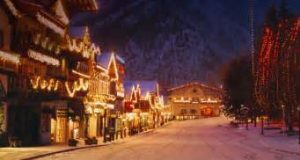 This year they have extended the show so families can enjoy it after Christmas Day. In addition to the raffle of 3 Lionel Train Sets on Dec 23rd, the show will host a Lunch with Santa on Dec 16th and two Polar Express Storytime hours on Dec 16th and Dec 23rd. Don’t miss this fun annual event meant to be enjoyed by kids of all ages! The show opens on Dec 3rd and ends on Dec 28th. See the calendar for show hours and activities. If you ask me why I love living in Sun City, I answer without hesitation – I live here because of my fabulous neighbors! The first weekend after my husband Mike and I moved in, several neighbors rang our doorbell and invited themselves in for a visit. We instantly felt welcomed to the neighborhood and now we regularly spend time with our neighbors at monthly “Fun Friday” block parties, holiday parties, and POD golf outings and lunches! And if that isn’t enough, Sun City Carolina Lakes has so much to do on the calendar. We are busier than we have been in years! We moved to the area to live closer to our family. Since then, they were relocated across the country, but MIke and I are happy here in Sun City and don’t want to leave! Save the Date: October 15th! 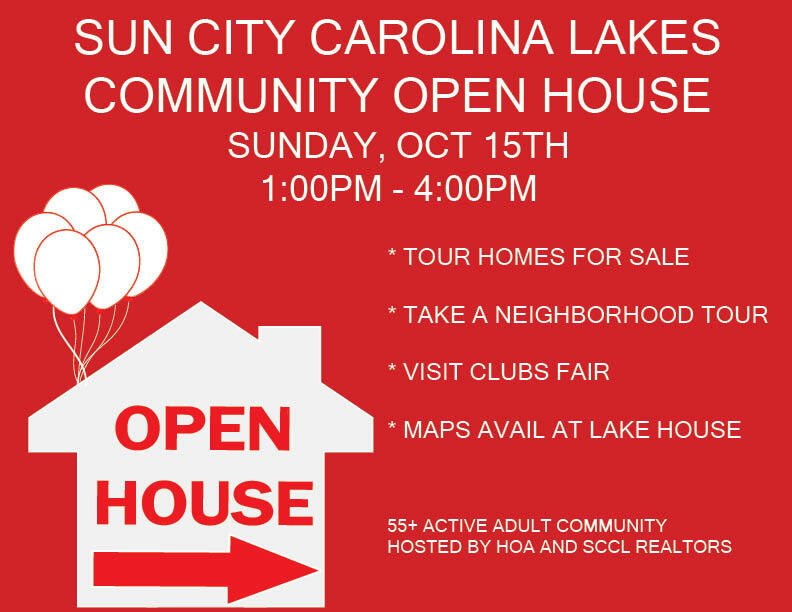 Sun City Carolina Lakes agents and residents will be working together to host a second Community Open House on Oct 15th. Please check back to our website for more details to be announced soon! We recently checked in with the sales office at Tree Tops to hear their latest news – they had a busy summer! As of the end of August, Tree Tops has sold over 200 homes – that about 25% of their planned construction. Of those, over 150 homes have closed. Amenities are well on their way with grading for tennis courts and pickle ball courts underway. The pool and Tree House building are currently under construction also and are expected to be completed by next summer 2018. During August, Tree Tops hosted a Grand Opening for the Rookery trail and they have completed 2 kayak storage areas for resident use near the lakeside. One of the announcements they were most excited to share is that all Lennar Tree Tops homes sold going forward as a “To Be Built” (not inventory) home will feature Wifi Certified Features and Whole Home automation. The package features Amazon Echo devices, Sonos music speakers, Ring video doorbell, Kwikset keyless entry lock systems, Honeywell Lyric thermostats, and more! At this time, Lennar is the only builder in the country offering these systems included! It’s an exciting time for this new development! If you would like to learn more, please contact us. Team Pogue specializes in the 55 plus market and Indian Land, so if you have questions about the 55 plus or Active Adult communities available in the area, give us a call at 803-504-1111. The Promenade at Carolina Reserve Shopping Center is currently the largest shopping center being developed in Indian Land. It will be located directly across 521 from Sun City Carolina Lakes – so residents and real estate agents alike are watching the progress of the center closely. Harris Teeter will be the largest anchor tenant. Some of the possible junior anchor tenants are still in negotiations but possible tenant names released recently include TJ Maxx, Hobby Lobby, Burlington, Ulta, Rack Room Shoes, Tuesday Morning, Petco, Five Below and Ross to name a few. Outparcel tenants are mostly still in negotiations as well but include everything from fast food chains to hair & nail salons. A Walmart Superstore is also being proposed as a tenant in 2019. For more information on some of the latest news, click here to check out the Lancaster News article published on July 23rd.